Image Taken in Michigan's Eastern Upper Peninsula during a partial thaw in early January. 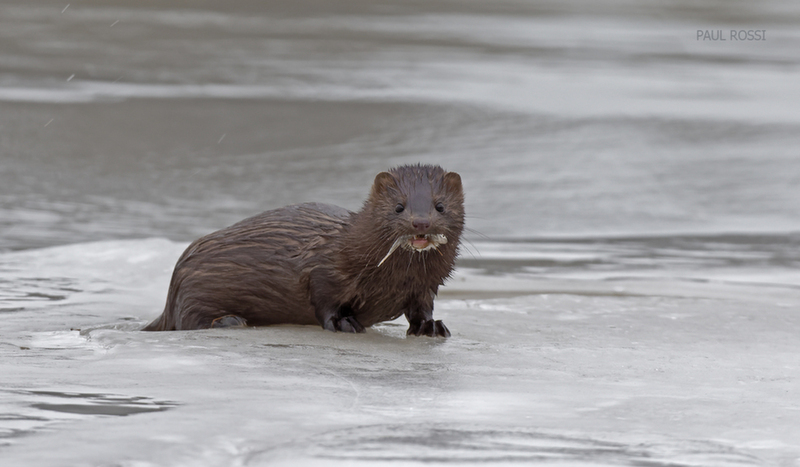 This mink would come up with various types of minnows through a few different holes and immediately eat them. Great timing to catch the mink coming out of the hole with a minnow in its mouth, Paul. It is certainly checking you out — great eye contact. You really made the most of your encounter with this feisty little predator, Paul. A great view with the minnow snack. Such a shame the light was so flat on this occasion - but that's what can happen when what could be a golden opportunity comes along! The general public in my area have already seen this image. They really like it as is. Cute! I like the eye contact. Great capture Paul, love that you got him head on with both his teeth and the minnow's eye showing, great stuff! Badass shot man! I just saw my first one here in west central Illinois yesterday. Always knew they were around but finding them was a different story.